How much candy would you purchase with $4 million? 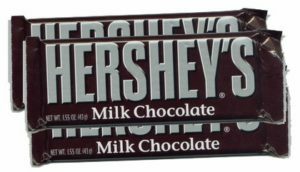 Yesterday in Virginia, a man named Mike Murphy purchased a PayDay candy bar on a whim.. While at the counter, he decided to also purchase a $100 Million Cash Extravaganza ticket from the Virginia Lottery – and that ticket turned out to be a “pay day” too. When he scratched the ticket, he discovered he’d won the game’s top prize of $4 million. Did you know that International Chocolate Day is on July 7th? Its a whole day devoted to that delicious cocoa-based confection! And since chocolate comes from cacao beans that grow on a tree, that means its healthy… right? – Tell others that its International Chocolate Day!